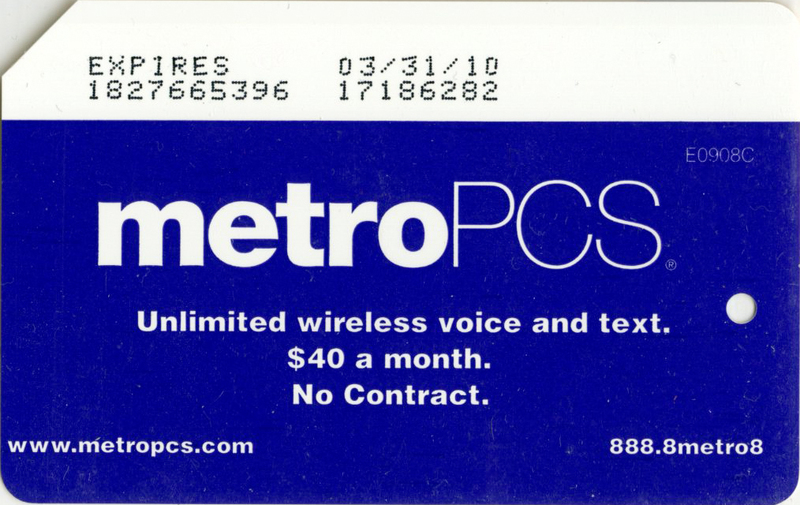 MetroPcs communication company sponsored originally one metrocard and few month late another one, the second metrocard has less circulation than first one. 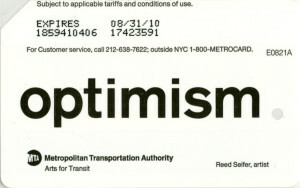 As part of ongoing arts for transit, MTA commissioned artist Reed Seifer to create new metrocard. He came up with a single word “optimism”. 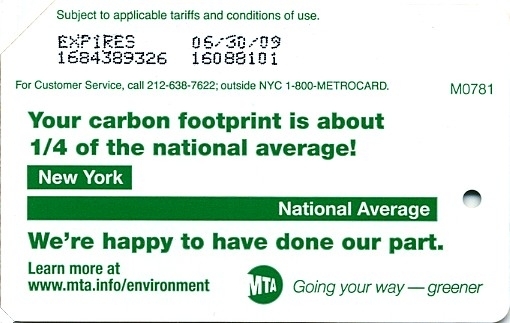 However he acknowledged that small hole at the end of the metrocard which looks like a dot was not in his design idea, it just happened. 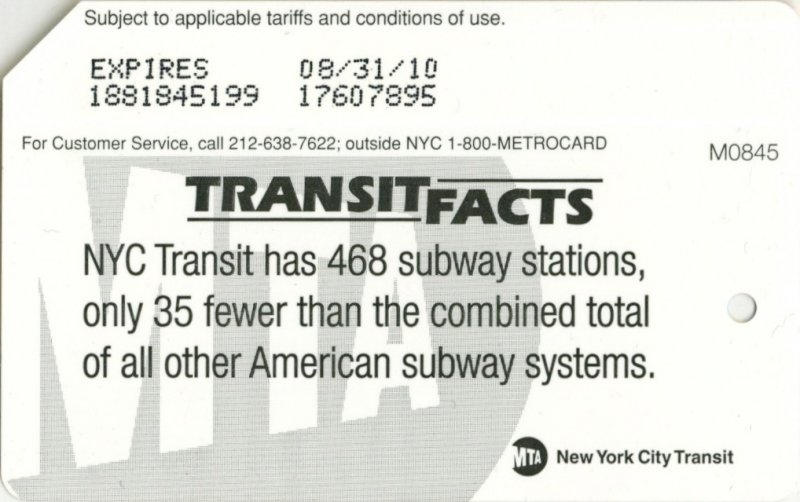 There are 2 versions of this card with different font. 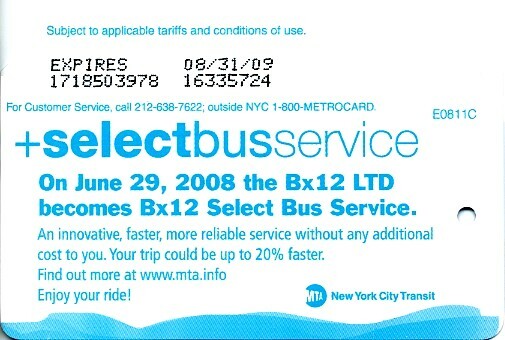 New version with very slightly different font appeared in January 2010. 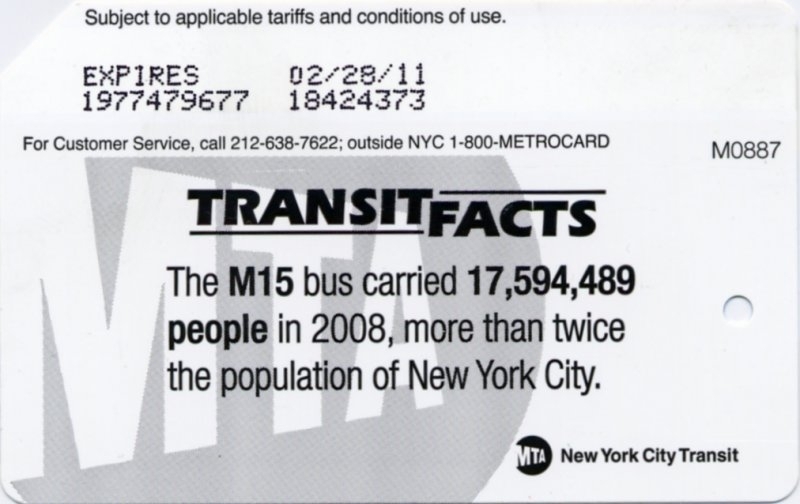 Total number of issued cards is 14 million. 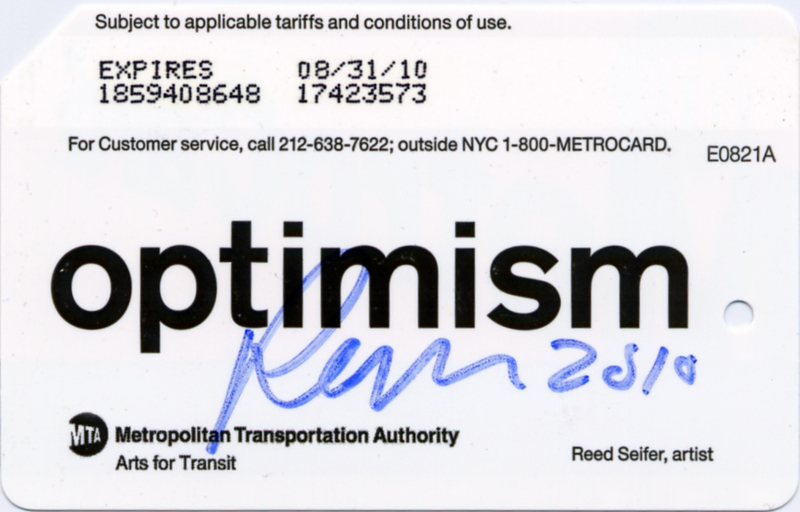 I met the artist who created this metrocard and got autograph on one of them. 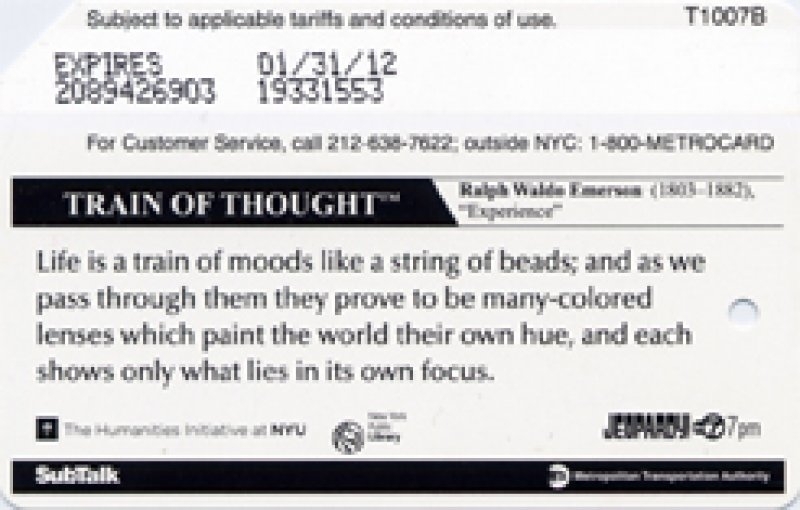 Another black and white series introduced in 2009: “Train of Thought” sponsored by New York Times and WQXR radio also owned by NYT. 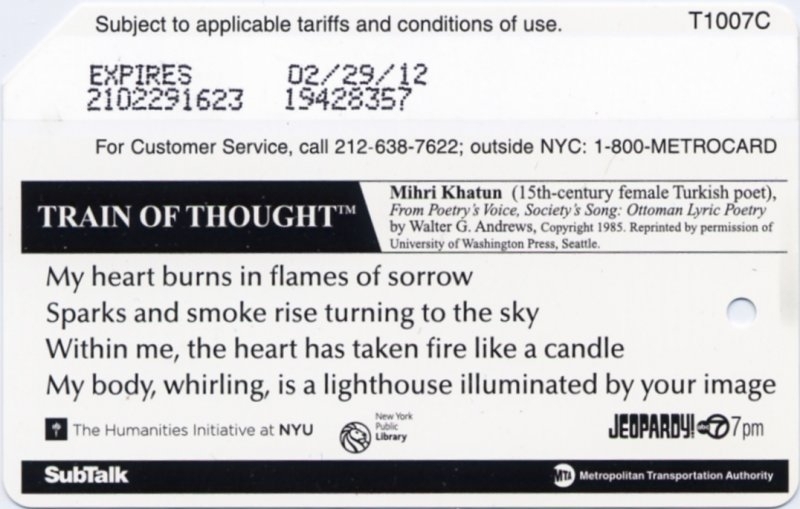 Each card has a quotation from famous writer or thinker. 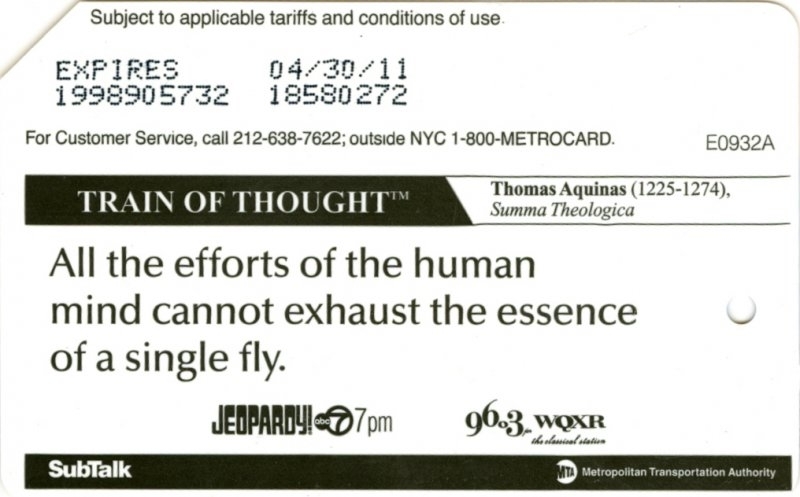 Since NYT sold radio station WQXR Jeopardy! ABC7 show start sponsoring this series. 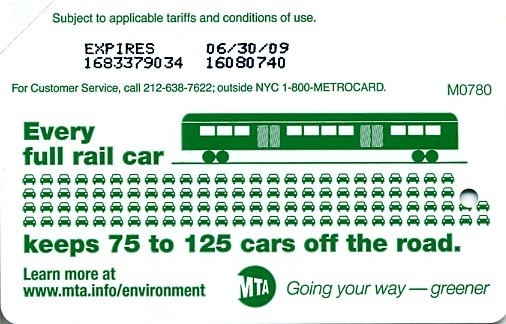 All together there are 26 cards already. 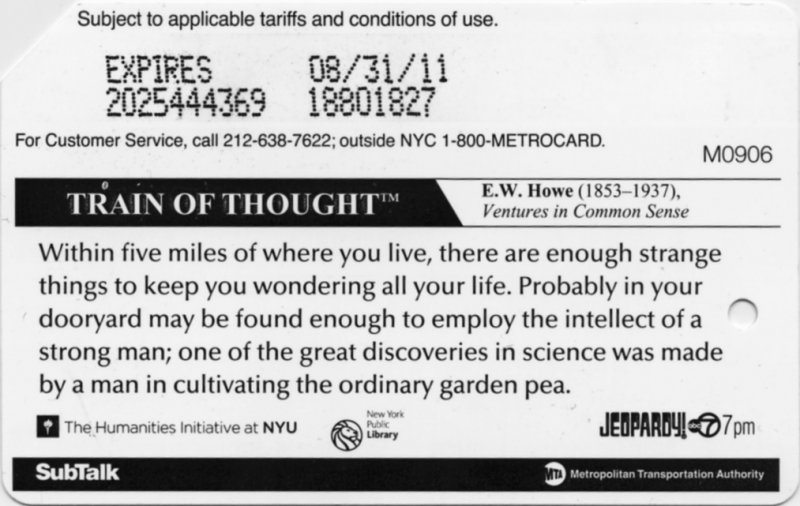 Quotations from Shakespeare, Einstein, Elliot, Donne, Kafka, Poincare, Darwin, Lincoln, Kant, Morison, Arnold, Chuang Tzu, Herodotus, Nietzsche, Poincare, Howe, Wilde, Greeley, Whitman, Emerson, Khatun, Boethius. 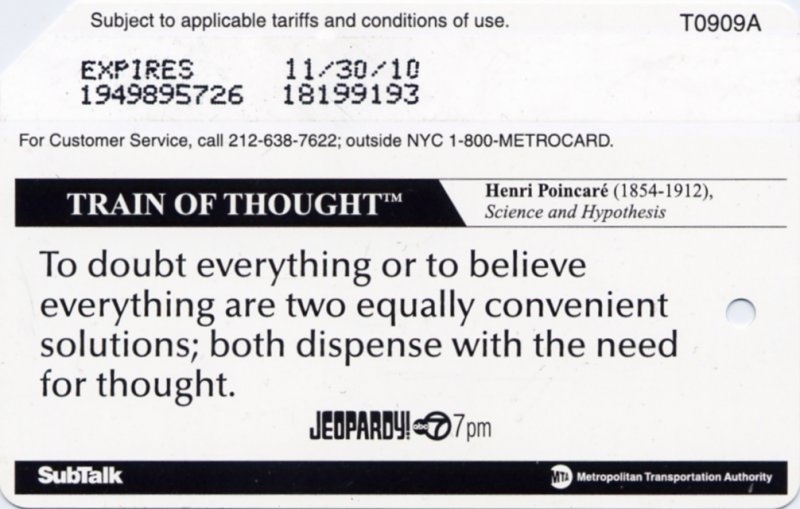 The last cards have different sponsors: Jeopardy! 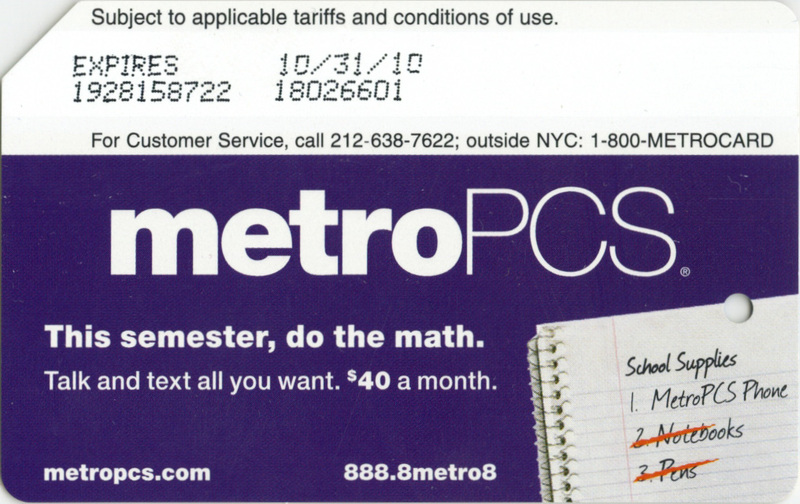 ABC7 stays as a sponsor, but New York Times dropped out and was replaced by New York Public Library and The Humanities Initiative at NYU. 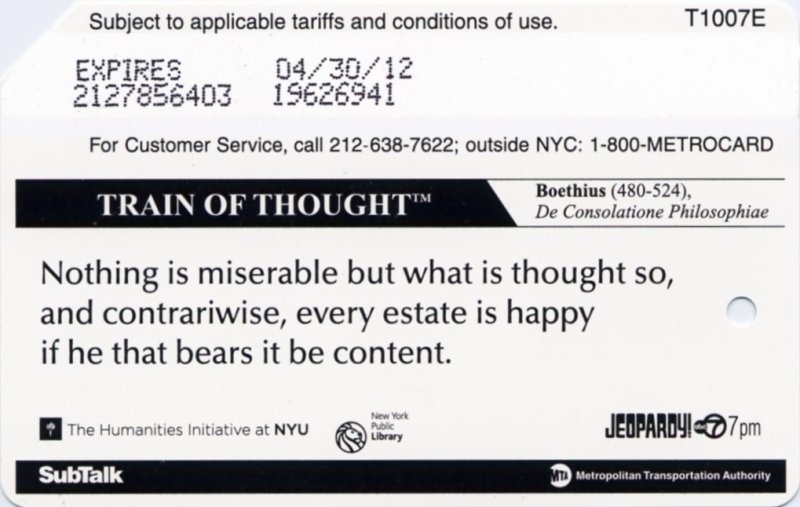 It was very obvious choice to start this series with quotation from Shakespeare. 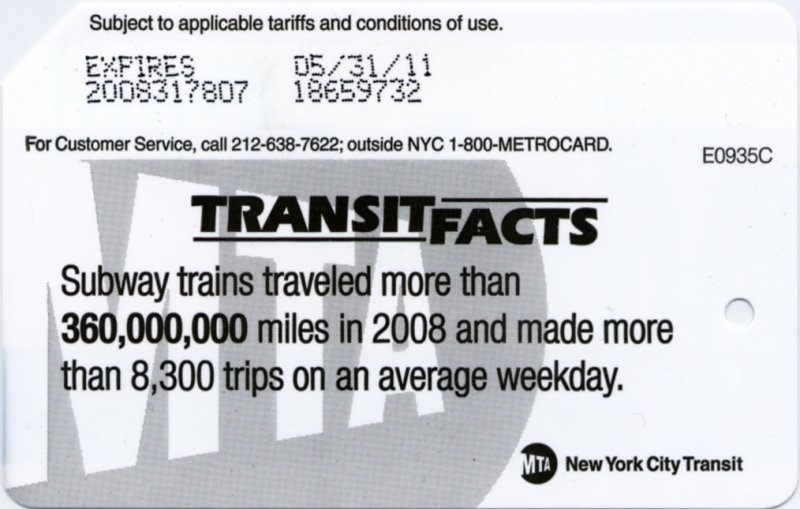 MTA issued metrocards with some facts about subway system. 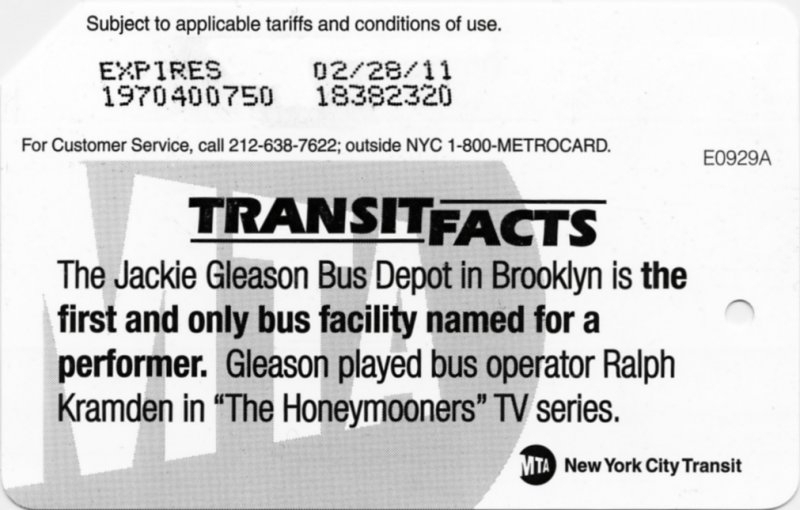 Series was named ‘Transit Facts’. 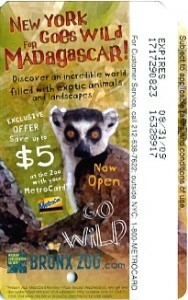 This MetroCard promoted exhibition Madagascar at Bronx Zoo and gave $5 off regular price of ticket. 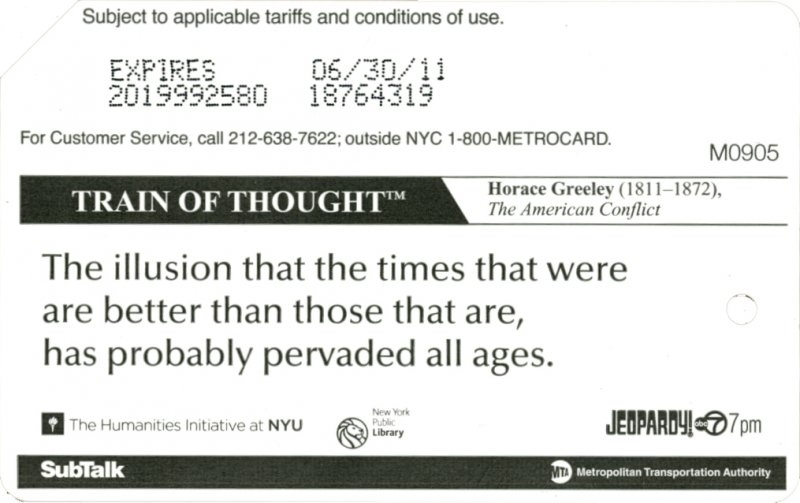 Matching leaflet has been published too. 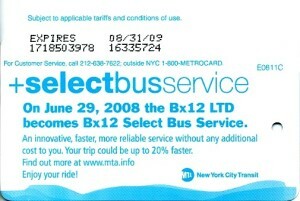 In June 2008 MTA introduced ‘Select Bus Service’ first in the Bronx on route Bx12 LTD. 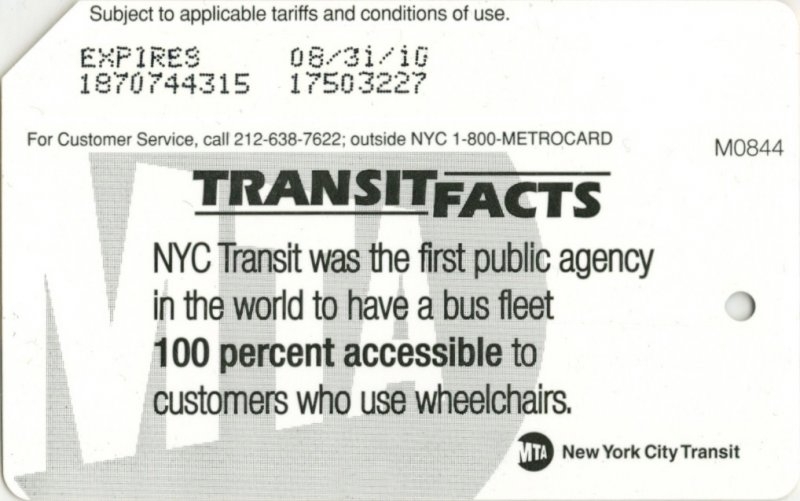 It allows customers to pay for the ride on the bus stop rather than in the bus itself which suppose to speed up boarding of passengers. 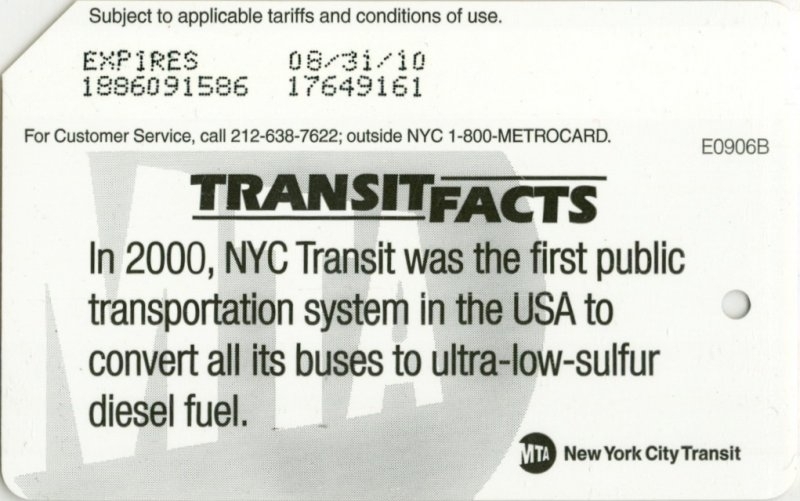 Later the same service was introduced in Manhattan and there are plans to do the same in other boroughs. 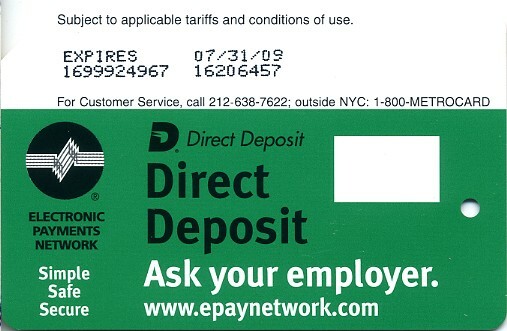 This MetroCard has advertised direct deposit and was sponsored by epaynetwork.com. 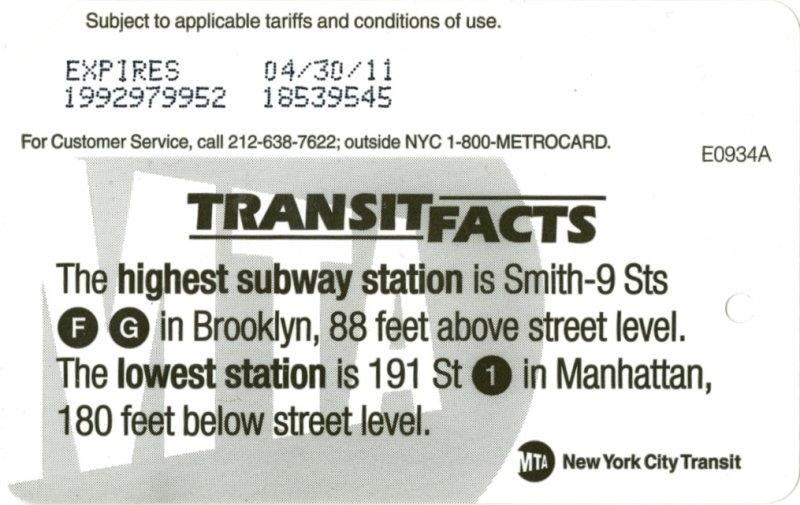 Card was distributed only in Downtown area subway stations and has lower number of circulation. 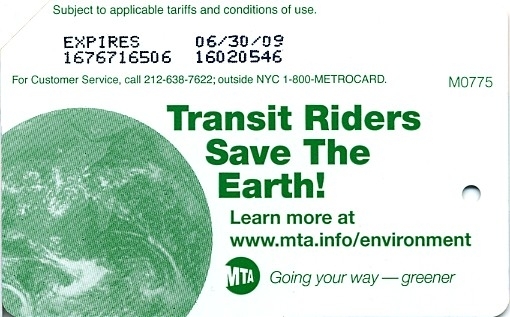 Earth Day 2008 celebration in April was commemorated with set of 5 metrocards with distinguish green colors on both sides of metrocard (on regular metrocards front side has MertoCard in gold color). 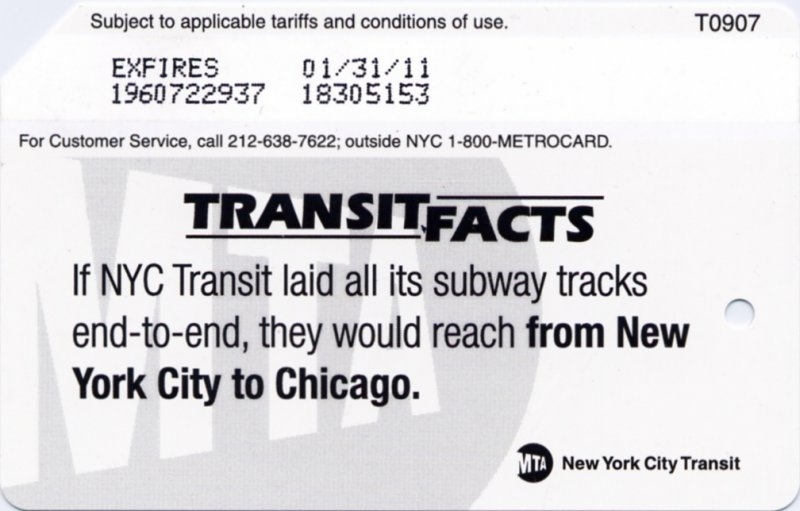 Set has circulation of about 1,000,000. 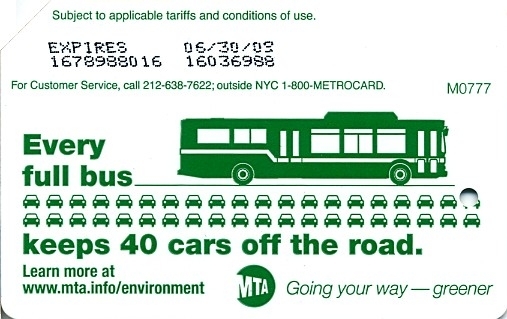 MTA motto has been slightly changed: Going your way – greener. 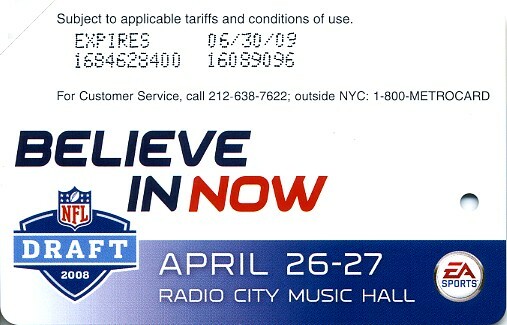 This metrocard advertised NFL Draft 2008 held in Radio City Music Hall on April 26-27. It has motto: Believe in NOW. 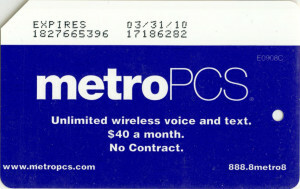 Card was sponsored by EA Sports (Electronic Arts Company). 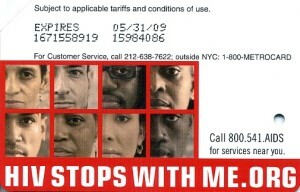 This MetroCard has been issued to promote hivstopswithme.org web site and been distributed only in Chelsea area subway stations. 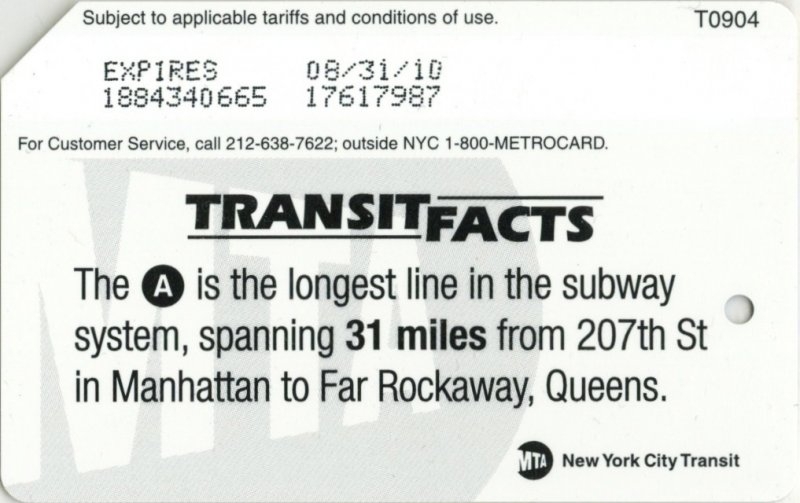 Area is famous in New York for high concentration of LGBT members. 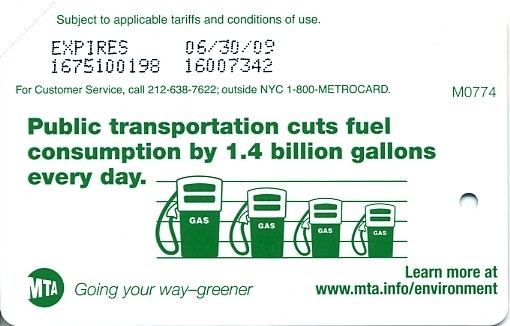 Card does not have big circulation and was quickly sold out.